People using the latest technologies are often well-off, younger, urban and tech-savvy – or none of the above. 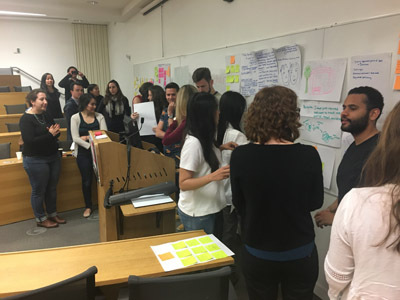 This was the disruptive reality that 20 students (at left) from the London School of Economics imagined during a recent design thinking workshop. The three-hour session, conducted as part of the school’s relationship with SAP, challenged the non-techie undergrad and grad students to brainstorm how innovations in banking could help people with disabilities – physical, social, psychological – realize their business dreams. It was their first-ever experience using design thinking, and a revelatory exercise that broadened their minds. Working in small groups, the students created several personas of non-traditional banking customers. The challenge was to apply an “internet of good things” approach to meet each person’s unique requirements. Persona 1: A high-powered businessman turned monk, disappointed with his previous life, seeks a more spiritual existence. Now living in Tibet, he aims to build a non-profit temple supporting the local economy. He uses cash-less transactions-in-kind and barter from his remote location. Drones could fly in small-denomination cash and smaller barter goods. RFID chips could track livestock and materials for farmers and people making small crafts, turning the temple into a source of security when animals go astray or materials are lost or stolen. A digital voice assistant could automatically translate words and enable basic transactions between two people who speak different languages. The temple could house a local 3D printer station creating objects to help maintain local goods. Persona 2: A flight attendant dreams of opening a café on a boat that would travel the world, allowing him to pursue his hobbies playing the guitar and sailing. People with disabilities would be able to book ideal locations, travel times and rates using banking services powered by big data and analytics. A currency conversion selector would allow customers to set and receive the best ticket prices based on purchase dates, trip timeframes and destinations. Travelers could also request and buy specific supplies sourced from local businesses at various ports along the journey. Even for these top students who will likely go on to assume senior roles in banking and economics, it was a stretch to consider the unobvious, which is critical to disruption. Gollogly added that SAP is launching a Next-Gen Community powered by the SAP Leonardo Center with the University of Portsmouth in the United Kingdom this month.